These bright apartments are located just 50 m from the peaceful Neuensiener Lake. Over The Bridge offers apartments in 2 separate buildings of various sizes, a quiet garden and free WiFi.Each apartments comes with a living area with a dining table and sofa. Most enjoy a view of the garden and surroundings. 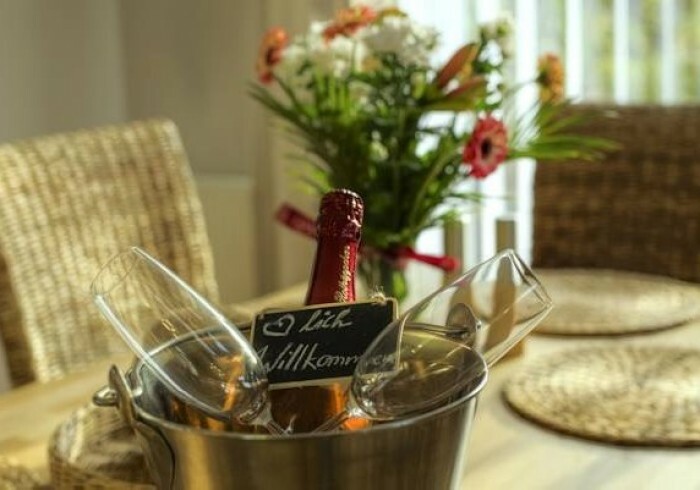 A furnished terrace is included as well as towels and linen.Guests are provided with a kitchenette including a coffee machine and some include an oven and dishwasher. Barbecue facilities are also provided, while the nearest restaurant is located just 500 m away.To best explore the scenic countryside, Over the Bridge offers bicycle rentals. The picturesque beaches of eastern Rügen lie 6 km to the east. The area is also a popular fishing spot.The property offers free parking. The Danish ferries at Sassnitz lie 18 km from the apartments. Short Directions: Follow the B96 for about 20 km to the large intersection just past Mc Donalds. There please turn on the B196 towards Bergen / Binz / Göhren. If you now always follow the B196, after about another 16 km you will come to a large sign Neu Reddevitz / Preetz. Follow the road for about 3 km until the next intersection and turn left to Preetz. Please drive through this street, through Preetz, shortly after, on the right hand side is your holiday home. For a Navi: 18586 Preetz enter, drive through the place, shortly thereafter on the right side is our property (House with green and white shutters).